The New York Fashion Week presentation September sixth had a mere six outfits. On a short runway. In a small space. In a show shared with five other companies. 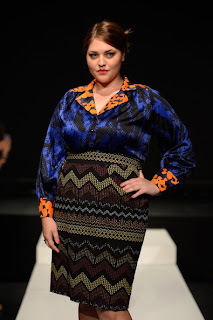 Yet plus-size company Cabiria managed to steal the limelight from big names before, during and after the fashion tents were folded up for another season showing the first plus-size collection in the event's 70 year history. I am still grinning....and also grimacing that it's 2013 and this is just happening now! 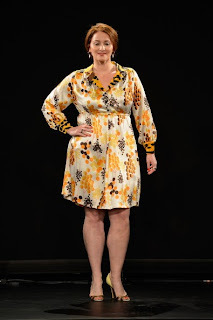 Cabiria creator Eden Miller accepted an invitation from the Fashion Law Institute, a non-profit organization that offered to fund her show and presented her Spring/Summer 2014 collection along with five other handpicked designers. What a fun leap from having just raised funds for her Spring/Summer 2013 collection on Kickstarter, surpassing her goal by $5000! Her whimsical line of colourful dresses runs from 12-24 and gives a nod to retro styles while keeping a modern spin. Press for this young company has been phenomenal and it seems future orders are matching the buzz. 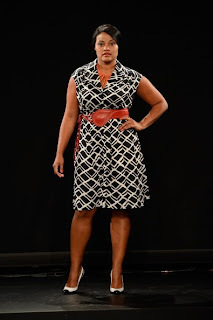 Here's to the small show that was bigger than ever imagined and to the first curvy collection to cross the threshold of the New York fashion tents. May it be the first of many!